We are a friendly, approachable firm where you get to talk to the same person each time you call - no call centres here. We are a firm of professional accountants and tax advisers based in London but with clients located throughout the UK. 123 Contracting was founded and is headed up by Christopher Joynes. Chris worked as a freelance contractor himself and saw there was a great need for simple and efficient accountancy and tax advice for freelancers – 123 Contracting was born. 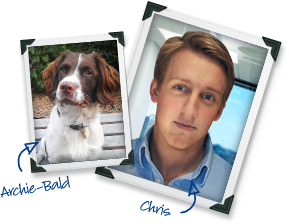 Chris is supported by a small team of professional accountants and tax advisers and by the 123 office dog – Archie our 18 month old Springer Spaniel. Our clients cover a whole range of industries, from oil and gas engineering, graphic design, digital media and the creative industries to management consultants, financial analysts and actuarial services. From health care professionals to IT consultants, copywriters to photographers and freelance journalists – no matter what industry you freelance contract in, the chances are we have a wealth of experience working with people in your industry. 123 is a paperless business and we offsets our carbon footprint from our energy use to ensure we are carbon neutral. We are members of Act on CO2 and 10:10.